Parking revolutionary Prof. Donald Shoup has announced his retirement from full-time academia, prompting various glowing tributes, such as this, this and this. I won't add to them today. But today's post includes evidence of Shoup's international influence. 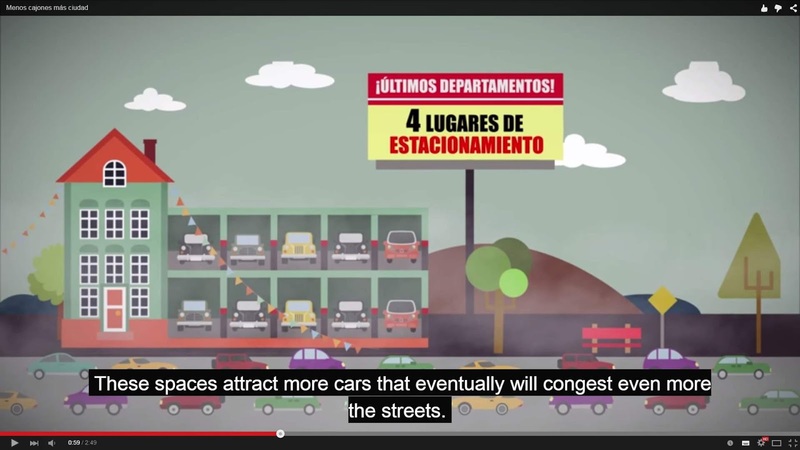 The folks at ITDP Mexico (who include Reinventing Parking author, Andrés Sañudo) have released a short animated video to complement the report. And Donald Shoup's epic intellectual battle against minimum parking requirements has clearly influenced their work. The video, "Less parking, more city" (Menos cajones más ciudad), is relevant almost everywhere, not just to Mexico. It is in Spanish with English subtitles. It is only 2 minutes 49 seconds long. So take a look right now and feel inspired. To learn more about ITDP Mexico's parking work, see here and here (in English) and here (in Spanish).